Comes with one media filter. It is recommended to change the media filter annually and more often if there are smokers in the home. 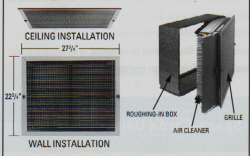 This model is designed for installation where a single central return air duct is used. It is easily surface-mounted in the location normally occupied by the return air grille of the central heating/cooling system. It can be installed in the wall or ceiling, making it equally adaptable for use with closet or attic installations. The only visible part of the installed unit is the aluminum grille. Filtering area is 78.6 square feet. Size: 27 3/4 inches in length, 22 3/4 inches in height, 9 1/4 inches in depth. Uses Media Filter #201.